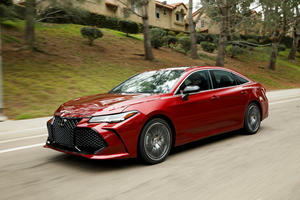 The redesigned fifth generation Toyota Avalon brings a touch of Lexus class to the everyday brand, sharing underpinnings with the Lexus ES. A 3.5-liter V6 is the sole non-hybrid engine offering, with outputs of 301 horsepower and 267 lb-ft of torque. An 8-speed automatic transmission is the only gearbox option available. Four trims are offered on the Avalon: XLE, XSE, Touring, and Limited, with a base MSRP of $35,500 for the XLE model and the Limited at $41,800 before options. The Touring offers up the most luxury, with heated rear seats, a heated steering wheel, a color head-up display, ambient lighting and genuine aluminum interior trim. The Nissan Maxima and Chevrolet Malibu are chief rivals to the Avalon in the full size sedan segment. Avalon. It's not a name that stokes adrenaline or stirs the heart. Rather, Toyota's Avalon owner base is more likely to suffer from some sort of cardiac arrhythmia than to go bungee jumping. The flagship sedan has kept health conditions in check by being wholly anodyne and completely boring, but Toyota has changed the Avalon recipe for 2019. Japan's official merchant of mundane has made its new Avalon a bit sportier in a bid to sell the big sedan to the millennial set. A sporty Avalon for young people? Join me in a chuckle. Before we get into that, let's start with the basics: the rides atop the same TNGA-K platform as the most recent Camry and forthcoming Lexus ES. The modular architecture allows Toyota to stretch the Avalon a mere 2.8-inches longer than the new Camry. That's not what we'd call a massive difference in size—and the EPA agrees. The Avalon, like the Camry, is classified as a midsize car due to its (lack of) interior volume. Even with the modern platform, the new Avalon is husky, gaining between 100 to 200 pounds of weight depending on trim level. Toyota claims the Avalon's newfound girth is mostly due to extra equipment added to the new-generation car. Under its hood, Avalon offers two gasoline-fed powertrains. A naturally aspirated 3.5-liter V-6 engine is the base mill, and it produces 301 horsepower and 267 lb-ft of torque (representing an increase of 33 hp and 19 lb-ft) while returning 22 mpg city, 31 highway, and 25 combined, according to EPA estimates. Alternatively, an available hybrid drivetrain is paired with a 2.5-liter four-cylinder engine and is good for 176 hp and 163 lb-ft of torque. Fuel economy increases to 43 mpg city/highway/combined for that powertrain. Base model XLE cars eke out an extra mile per gallon on the city cycle for V6 and hybrid models due or lower weight. Every trim except for the top-spec Touring can be had as a hybrid for an extra $1,000. While all Avalons send their power solely to the front wheels, V6 models transmit their output through an all-new eight-speed automatic transmission that replaces the six-speed unit from the outgoing model. Hybrids are gifted a smooth-as-silk continuously variable transmission. At this point, I can't really talk much more about the Avalon without explaining Toyota's new sales strategy. There aren't many options on the market more intrinsically linked with the blue-haired crowd than the Avalon, yet Toyota is dead set on lifting the large car's fortunes by widening its appeal to more than its traditional clientele. That doesn't mean the Japanese automaker is willing to send its loyal buyers out on an ice flow, banishing them to another big sedan for eternity. Rather, Toyota has employed a class-and-sass approach to give the Avalon a split personality of sorts, not unlike what Hyundai, Cadillac, and Volvo have done over the last few years with the Sonata, XT4, and XC40. The Avalon will retain a more conservative look for XLE and Limited models—grades Toyota categorizes as “Premium”—for buyers who've grown accustomed to the staid sedan and don't want it to change, but Toyota has given the other two trims a more visually aggressive design and some different operating equipment to entice the under-40 crowd. 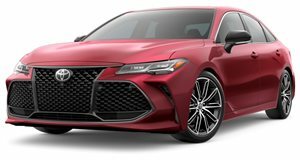 Toyota categorizes those trims—XSE and Touring—under the “Sport” banner, and they're easily differentiated by mesh grilles, larger 19-inch wheels, quad chrome exhaust tips, and black mirror caps and rear spoiler. Toyota didn't stop there. Inside, the XSE and Touring models are given only grey and black interior colors, SofTex-trimmed seats with Ultrasuede inserts, aluminum trim, paddle shifters, and aluminum pedal pads. The changes give the Avalon an angrier, Lexus-like appearance on the outside to match the noise it generates inside. Sport-trimmed cars employ an Intake Sound Generator and Engine Sound Enhancement to give the driver an extra aural sense of velocity—whether real or imagined. New for Avalon, Sport, Sport S, and Sport S+ modes activate Engine Sound Enhancement and turn off Active Noise Control. Sport S+, only available on Touring models, also tells the newly added Adaptive Variable Suspension to prioritize handling and stability over comfort. Regardless of your choice of trim, all Avalons are fitted with an independent MacPherson front and multi-link rear suspension setup. Gratefully, that's where the differences end between the Avalon's two pillars, because I can't see why Toyota would even bother with a series of sportier trims when there's little to no chance of people my age and slightly older buying one. My dismissal of Toyota's strategy was more than validated when we hit the roads in sunny California. For starters, even the sportier models didn't turn heads. At no point did the more audacious sedans draw the attention of passersby. 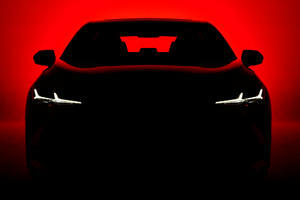 This, an unreleased sedan with an all-new design and a gaping maw the size of Joshua Tree National Park, couldn't capture the consciousness of those on the street. Not so much as a glance was garnered from those living in a state steeped in car culture. It didn't get much better when we hit the open road in a top-spec Touring model powered by the now more powerful V-6. While there is plenty of power on tap to hustle this big sedan, the eight-speed automatic is dimwitted in certain situations. For example, as we rolled up to a stop light and slowed down, the light turned green and I depressed the throttle by just enough to get the sedan accelerating once again. The engine did nothing for what seemed like an eternity, then the automatic slammed down a gear and made the whole car jolt forward. This happened more than once during our drive, and it wasn't the only situation in which we caught the eight speed off guard. In manual mode, the transmission ignored commands to go to a higher gear even when the instrument panel displayed the car had selected that gear. Even with the suspension set in the stiffer Sport S+ mode, we didn't experience a notable improvement in handling and only gained the ability to feel smaller ripples in the road as we drove over them. As a sport sedan, the Avalon is a disappointment. There is one saving grace, however, and it's the hybrid. It may be less powerful, slower, and not have the fanciful flair of the Touring model, but the hybrid in XLE or Limited trims is as close as you're going to get to what a Avalon has been and always should be: an efficient, comfortable, drama-free sedan. Sure, it still has as much grille real estate as other Avalons, but at least it gets smaller wheels to better soak up the bumps. Furthermore, it's minimal cost of entry and massive gains on fuel economy make it a no-brainer for those laying down massive amounts of mileage. Regardless of driveline, the Avalon's interiors are the same trim-for-trim. A new 9-inch touchscreen provides Apple CarPlay compatibility and a new native user interface thanks to Entune 3.0. There's optional wireless charging for your phone and available upgraded audio with 14 JBL-branded speakers. A selection of thrones, swathed in SofTex to full leather, provided excellent lumbar support and comfort, even if the seat bottoms were a tad bit short to support my longer legs. But dreary interior material and color combos muted the experience. The sea-of-grey interiors hold no candle to the Germans, Koreans, or even some American and Japanese brands. Visible seams between plastic panels where there should be none took away from the Avalon's overall Toyota quality aura. Even the center floating console flexed significantly when grabbed and given a moderate tug. And let's not even talk about Toyota's aversion to Android Auto, which is still conspicuously missing from its new entertainment system. 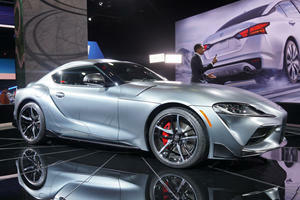 (Toyota cites privacy concerns for its omission, but the automaker is working on including it in the future.) Overall, the Avalon's interior was functional and comfortable, but it was far from impressive. As highly efficient transportation, there's not much on the market today that can best the Avalon. But if you're one of those millennials looking for style and moderate performance chops, nearly every competitor is better—300C, Charger, Maxima... you name it. The 2019 Avalon starts at $35,500 a destination fee of $895 for the XLE V6. Pricing stretches up to $42,200 for the top-rung Touring V6. XLE, XSE, and Limited models are all available as hybrids. First units will begin arriving at dealers in May.